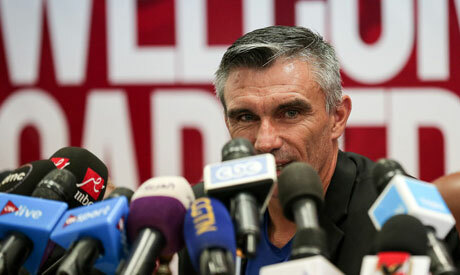 Ahly manger Patrice Carteron said on Thursday his men have the ability to win the African Champions League title, asking them to shrug off the anticipated pressure of the final game. Ahly will host Esperance de Tunis in the first leg of the Champions League final in Alexandria's Borg El-Arab stadium on Friday. The second leg will take place in Tunisia one week later. "The final includes two matches and I asked my players to be calm during Friday's clash as they will have the chance to overturn any negative result in the second leg," Carteron told the pre-match news conference on Thursday. ''I am fully confident of the capacities of my players but the most important thing is to play without pressure." ''I know that they are very exhausted but I am sure that they are capable of winning the title." The Frenchman said his first target when he took charge of Ahly was to help them win the Champions League title, vowing to do his best to accomplish this mission. "My target is to win the Champions League title. Now we will play the final and we are all determined to win the title." The former TP Mazembe coach said he is satisfied with the team's attacking performance, stressing that his side should employ an attacking strategy in the final. "Our attack is the best in the competition," Carteron said. "It is true that we squandered many goal-scoring chances against ES Setif in the semis but we realized our target and we reached the final." Ahly have been looking to win their first Champions League title since 2013 when they lifted their eighth trophy after defeating South African side Orlando Pirates.